The convention booths that attendees are going to remember the most are the ones that have trade show games and activities that will keep them engaged while also informing them of what your company does. As important as trade show displays are at gaining your audience’s attention, it is the activities and booth staff that will turn their attention into a possible client. 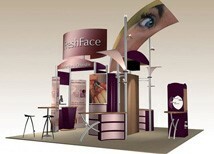 Here are some trade show ideas to take into consideration as you and your employees prepare for the upcoming event. As you are deciding who will be in charge of your trade show booths, take a look at the itinerary of the event to find out what times there will be the most traffic on the trade show floor and what times will be the slowest. Your staffers with the highest energy, most upbeat attitude, and outgoing personalities should be in your display system during the busiest moments. Most conventions take place for over 10 hours a day, so it is a little unreasonable to expect them to stay upbeat if they don’t get the much-needed break they deserve. Having other employees manage your booth during the slow times, which is usually at the beginning and ending of the event, will allow for your high energy employees to stay on their game and represent your company well when they are on the trade show floor. The first thing attendees will notice is the look of your trade show displays and they will quickly decide whether or not it is worth stopping by. Many exhibitors assume that the more information they squeeze into their graphics, the more they will reach their targeted audience. I like to think of trade show graphics like billboards along the highway – they are simple with only one or two photos and a couple short sentences that let’s their target audience know who they are and what they do, and bold colors. You only have between 3 and 5 seconds to appeal to attendees, so keep it simple and they will come to you. Effective portable displays do not have to be expensive; whether you have banner stands, pop up displays, or truss systems, well-designed graphics is what will help them decide if they are or aren’t interested. First things first, having a specific budget in mind will make it much easier to make this big decision. Know what the total amount is that you want to spend as well the size of the event to decide how much to spend per item. For example, if you are going to a massive trade show like CES, there will be thousands of attendees so you will need to order more promotional items than if you were going to a convention that only had a few hundred attendees. Second, your giveaways should be something that would appeal to your target audience as well as being related to your business. For example, if you were a painting company and wanted to attract more families, you may want to hand out paintbrushes with your company’s logo and name on it. To save you money on expensive trade show promotional items, consider having two separate items: a large quantity of inexpensive items that you can hand out to everyone who stops by your booth and a few expensive items you can give to leads who are very interested in doing business with you. This way everyone will walk away with something to remember your trade show exhibit by, but the potential new clients will leave with a gift that will keep you in the front of their minds when they are ready to buy. About the Author: Kristin Hovde is the Marketing Manager for Smash Hit Displays. We sell hundreds of portable displays to fit every style and budget, including banner stands, pop up displays, and custom displays.